After last week’s struggle I was looking forward to fishing Longs this Sunday but feared the worst when I saw on an angling clubs blog that they had it booked for a match and sure enough Pete phoned in the week to say we’d be on Sellicks again. I met Hurf at the Little Chef for breakfast as he was off to fish the Taunton match on the Tone, which was a nice start to the day but I also received a text from the Tart saying he was on his way to Pete’s, which wasn’t so nice! I got there in good time and Jeff Sparkes paid me his pound from the other week and I said he’d probably have it back today. While waiting for the draw, Pete showed us his new free range maggots! Along with Jeff, I had the usual pound with the Tart on our respective positions for carp and silvers and Gareth wanted a pound on both. The golden ball was drawn and today it was peg 2, which Rob Birch then pulled out, I went in and was happy with 19 on the far side, just next door to where I was last week. Rigs were the usual 0.3 gram NG Mini Gimp to fish top two on the right and a 0.6 gram Malman Pencil for two lines straight out and angled to the left at ten metres and also a line at five metres. As always my side tray was nice and simple, Bait-Tech 2mm Carp and Coarse micros that I’d soaked the night before plus 4mm Xpands for the hook. This week I thought I’d treat you to the view looking up the pond! On the whistle I fed some micros on all four lines before starting on the top two, in almost a carbon copy of last week, I had a small tench quite quickly but unlike the last match I was getting a few indications so stuck with it and added a small roach on the half hour mark but when I saw Roger up on 14 land a skimmer it was time to try my longer lines. I had a hand sized skimmer followed by a small carp and then another little tench to finish off a steady first hour and I felt a decent weight was on the cards. I should have known better, the second hour was awful with the only action coming from the inevitable foul hooked carp. Pete turned up and said it was fishing really hard, Rob hadn’t had a fish yet on peg 2 and Jeff only had a couple of silvers. While he was behind me I had a good bite and struck into a little blade which of course came off as I shipped back and then I hooked yet another carp. Just after he left, I saw Roger land another skimmer and then out of the blue, I’ve had a slightly better skimbob but it appeared to be a loner. 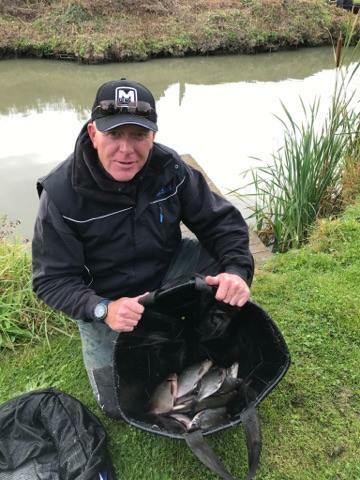 As the halfway point arrived I only had about a pound in the net but if last week was anything to go by, it would only take a couple of better fish to get a result today. Jack Billett was on 21 and catching carp quite well and it was neck and neck with his brother John who was on 23. There was another Jack on my right, a young lad who travelled up with the Tart and he was catching a few and seemed like a nice young man, although that won’t last if he spends too much time in the Tart’s company! It also started raining and Roger walked past to get his coat from the car, he said he’d had three skimmers and a crucian so he was well ahead of me. I had a spell of missing loads of bites on the longer lines and I did lose a slightly better skimmer when I went to unship at the top two. I eventually managed to hit one of those bites and it turned out to be a tiny blade. I had a quick go on the inside but when I lost a carp, that was enough of that. With two hours to go, it was time to try the five metre line for the first time, I had a bite quite quickly and hooked a little tench that came off at the net which about summed up how the day was going. I started getting quite a few indications and had another tiny little blade so upped the feed to try and get rid of them, it worked to a certain extent as my bites dried up! I did have a couple more carp and two more hand sized skimmers but I knew I hadn’t beaten Roger and I hoped those two lost fish weren’t going to cost me. 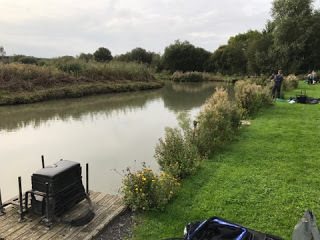 After packing up, we all gathered at Rob’s peg to await the weigh in and while we waited we watched Captain Pugwash aka Mike, in the boat trying to retrieve some lost pole sections. I asked Rob how he’d got on and he said he was blanking after two and a half hours but then had caught a few on paste and was admitting to 5-6lb and I was pretty sure nobody else had that so he was in line for a bumper payday. The Tart arrived and was admitting to 60lb, it was looking like he’d be in the top three so I gave him a pound, then Jeff said he was admitting to 3lb of silvers so I paid him as well and all I needed was Gareth to have caught a few silvers and I’d be skint! 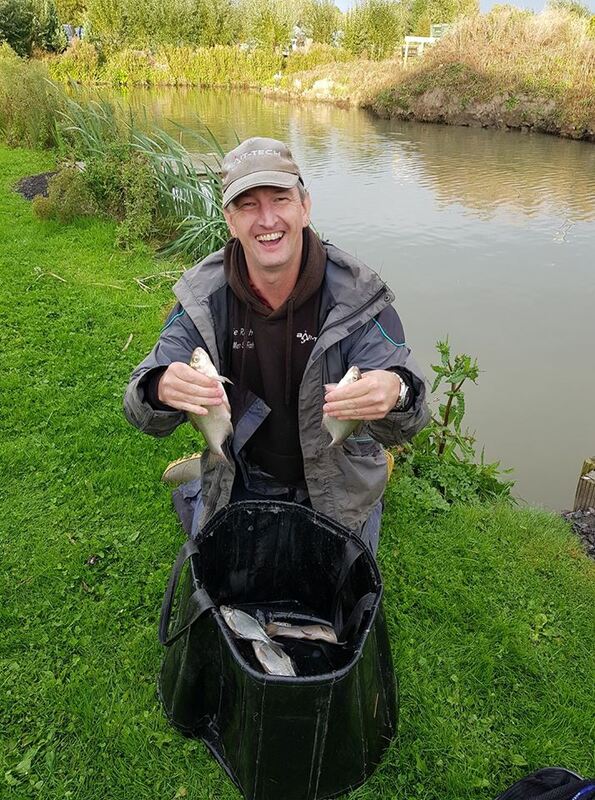 Pete arrived with the scales and when Rob pulled his net out he had some nice skimmers and his weight was 7lb 13oz, well done mate. 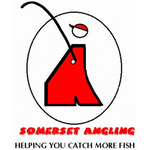 Jim Jenner was next and stuck 97lb 12oz on the scales, Mike didn’t weigh as he was having too much fun in his boat and then Jeff had 3lb 8oz of silvers, the Tart had 80lb 14oz to go into second place before Gareth had 58lb 11oz but as he didn’t have any silvers, that side bet was quits – phew! Duncan had 50lb 8oz from peg 12 and then Roy Hughes pushed the Tart down into third place with 87lb 14oz. Roger was next and when he pulled his net out, it was going to be tight and the digital readout settled on 3lb 6oz. Darren K didn’t weigh and then young Jack had 34lb 1oz from peg 17. So Jim won on the day and Rob took home a big fat envelope for winning on the golden peg and both him and Roger have been hard to beat on silvers all summer. 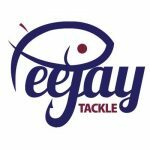 Next week we’re on the river for the first match of the winter league and I’m really looking forward to it as some of the lads have been down swim clearing and are reporting loads of fish about. 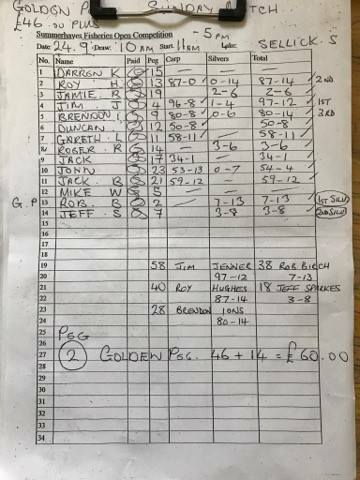 I can’t go without saying well done to Hurf who had a better day than I did when he finished second in the Taunton AA match on the Tone at Newbridge with over 7 kilos of quality roach on the waggler.